So, the GT Omega Pro XL. We’re very familiar here at Play3r with the GT Omega brand and have been very lucky to review their products before. Dave M reviewed the Evo XL back in February last year and it was well received with a Gold Award. So with this, I set out by removing my other branded chair and donated it for 3 weeks to the girls in the office next door so I could give it a thorough and uninterrupted run. As soon as I heard that the Pro XL was en route I was eager to get it open and give it a try. The Pro XL is, as you’ve probably astutely guessed, designed “with the larger users in mind”. Being wider, taller, and having a higher maximum load of 150kg. As expected, shipping a XL chair is no mean feat. The GT Omega came in a huge box which the courier kindly left at the bottom of the stairs for me, leaving me to carry (with some help of my boss) up two flights of stairs to my apartment. Weighing around 35kg’s and being the size of a person, it’s not advisable or physically possible even to do it alone. Before I start with the run through of putting the chair together, please find below a handy dandy diagram of the Pro XL’s sizes. Opening up the box, it was immediately clear that GT Omega has gone to lengths to make sure it arrives in perfect condition. I was pleased to find that every item was in perfect condition knowing full well that this thing was probably pushed, pulled and dragged around to get here. The GT Omega Pro XL comes with everything in the box to get the chair installed and set up. A pair of Allen keys, bolts and washers were all that was needed to get going. The single page installation guide has all the information you need and it’s well laid out and easy to understand and follow. The first step is to put the caster wheels, gas lift piston and piston covers on the 5-star base. This was a very simple affair as it all went together smoothly. The next step is to attach the back seat to the seat base. This is done by laying the base flat on the floor and making sure the seat angle adjuster is set at 90 degrees. With this done the seat back sits nicely in place. You then screw in 2 M8 screws labeled (I) on each side to hold the seat in place with the Allen key. You then add the two plastic covers and screw that into place with a single M6 screw labeled (J) with the Allen key. Now it’s time to add the mechanism to the bottom of the chair. I turned the chair over on its front and rested the mechanism on it. This allowed me to easily screw in the 4 remaining 4 M8 screws also labeled (I) with the Allen key. Finally, it’s time to insert the gas lift piston onto the notch of the mechanism. It may take a bit of moving/wiggling but take your time and you’ll get it in easily enough. Next, it’s time to add the 2 plastic levers on the side of the chair. The right lever adjusts the chairs height and the left controls the lock of the tilt mechanism, this works by leaning back to the desired angle and lowering it to lock. To release and return to normal simply lift the lock back up and away you go. The 4D armrests are quite large in size and offer unparalleled customisation if you need something that isn’t just set in a singular place. The armrests offer adjustments to the height, depth, width and even the angle, and feature a PU padded coating which means they’re grippy, but comfy at the same time. The upper section of the backrest has a stitched logo on the rear. This follows suit on the front with the same logo as well as a separate “GT” logo with wings. The GT Omega Pro XL also comes with two, for lack of a better word, pillows. The top one is a headrest and the larger one is for lumbar support. It’s great to see these included but personally I found the lumbar support pillow to be just a little too firm, though it may well soften over time. I think this is due to the choice of material with it being made of leather and not a softer “cushion” material. Finally a picture of the GT Omega Pro XL suited and booted. The one I have here for review is the black version, but the Pro XL lineup is also available in black and blue, black and red and black and white. The GT Omega Pro XL is a gaming chair designed for larger people to buy and use/game more comfortably. The Pro XL is available for £269.99 direct from their website and this is a fixed price for the whole Pro XL range of colours. The quality of the Pro XL is excellent. The build quality of the chair is near perfect with almost perfect stitching on the leather which gives it its premium look and feel, even down to the arms, the piston, the metal 5-star base and caster wheels. It was very well packed inside the box and the instructions were very easy to follow with the chair going up in around 45 minutes while pictures being taken. The feature set on the Pro XL is fantastic too with the chair having a 85 to -160° of range which is a huge 85° of tilt in the mechanism. The height is also adjustable and that maxes out at 1400 mm which is great for taller people too.The maximum recommended weight limit is 150 Kg, which seems to be the standard for gaming chairs that come in an XL offering. The armrests offer adjustments to the height, depth, width and even the angle which is perfect for those needing to adjust for a more ergonomic position; the knob on the side of the chair also allows you to adjust the amount of back support in the chair, which can be increase or decreased depending on your preferred configuration. 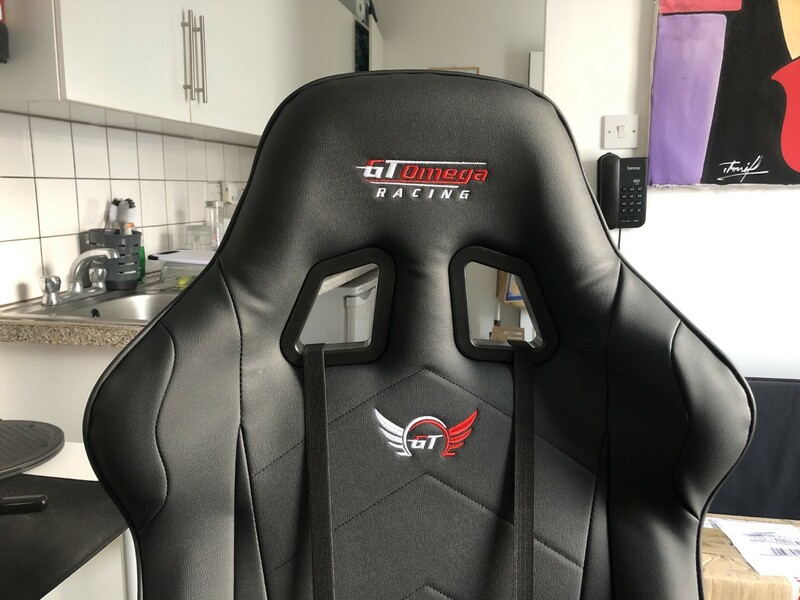 The GT Omega Pro XL is a fantastic gaming chair overall; from the comfort, build quality, to the final touches and features. They say you get what you pay for but when you factor the price, at the time of the review, coming in at £269.99 it’s a very, very attractively priced chair, especially when you compare it to competitors. I just think that the pillow and lumbar material choice needs to be reconsidered to be used more comfortably every day which it should. With this in mind, the GT Omega Pro XL gets a solid recommendation from me and is presented with our Gold Award. Additionally, it’s going to get our Recommended Award because I highly recommend it for anyone considering a larger gaming chair. Thanks to GT Omega for sending the Pro XL to me for review. Wishing to purchase the GT Omega Pro XL? The GT Omega Pro XL is a fantastic gaming chair overall; from the comfort, build quality, to the final touches and features. They say you get what you pay for but when you factor the price it's a very, very attractively priced chair, especially when you compare it to competitors.